HERE is the definitive work in its much anticipated 5th Anniversary revised and expanded 6th edition; the primary source book of the Mardukite Chamberlains Research Organization uncovered from their first active year of research and development in 2009! THIS SPECIAL ANNIVERSARY EDITION IS AVAILABLE EXCLUSIVELY FROM THE MARDUKITE TRUTH SEEKER PRESS!!! These are the raw underground materials have shaped the existence of man’s beliefs and practices for thousands of years; right from the heart of Sumer, Babylon and Egypt! 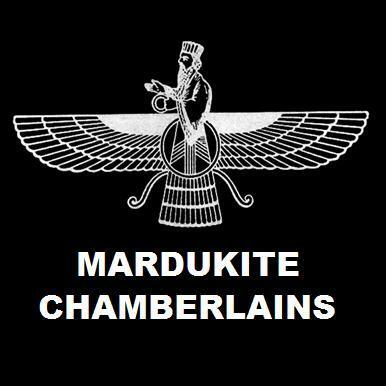 Studies include the Mardukite inception within Akkadian, Assyrian, Chaldean, Yezidi and Zoroastrian traditions also! This enlarged Sixth Edition includes the complete Maqlu Text recently translated for the separate volume “Maqlu Magic“ or “Necronomicon Spellbook II“ in addition to several other unique updates from previous editions! This 2014 large-format 5th Anniversary edition presents the original “Liber N” ‘Necronomicon of Joshua Free’ in addition to its three companion works from 2009 that were only released to the underground and members of Mardukite Ministries as well as newer materials from “Liber C” (Tablet-U and Tablet-V cycles) in addition to all tablets from the “Book of Marduk by Nabu” and also the “Book of Sajaha-the-Seer” (released in 2013 as “Sumerian Wisdom & Anunnaki Prophecies). Nearly 600 large easy-to-read pages guide you through a huge collection of raw historical, spiritual and mystical research drawn from archaeological findings; enough to support a very real Mardukite “Necronomicon” Anunnaki revival tradition! Join the now thousands of others who have enjoyed the best of what the next generation has to offer in the most amazing, revolutionary volume you’ll ever read! Ever since the visions of H.P. Lovecraft began to haunt the world, people from all walks of life have celebrated various interpretations of these musings. We are shown a world shroud in darkness that has been materialized by primordial malignant gods who fought one another for control of the Universe and for the worship of the humans who brought to them sacrifices and abominable litanies. But as many have already assumed, this NECRONOMICON tradition was indeed the product of Lovecraft’s imagination, and it only much later became known as the Cthulhu-mythos, a haven for horror-fantasy genre authors. For nearly a century thereafer, the NECRONOMICON remained a fictional product of dark fantasy until the famous “Simon” folio was presented to the world in 1977. While many readers superimposed the Lovecraftian lore into their interpretation verbatim, this new document did not present rituals by which the malignant Ancient Ones would be unleashed into this world – in fact, it suggested the exact opposite: beneath the foundation of the esoteric mysteries exists a secret and sacred tradition to fight against this very act! As an unfortunate move by its contemporary readership, the “Simonomicon” came under attack as being no more authentic than Lovecraft’s own stories. More serious practitioners came to a more educated conclusion: the magickal notebook (or grimoire) was incomplete at best, alluding not to the Enlilite traditions common to the “Sumerians”, but rather to a Mardukite tradition that was raised by the “Babylonians” in honor of Marduk, firstborn son of Enki, who ruled men and gods from the Tower of Babel. Since 2008, the range of the Mardukite work included lengthy discourses with other related published researchers, unceasing hours in abandoned corners of old libraries and museums, participation in sessions with other practicing occultists and even a visit to the “tablet collections” at the University of Pennsylvania and Chicago among others. The culminating results were nothing like anyone would have expected: an authentic and verifiable version of the Necronomicon salvaged from the shifting desert sands of time in the Middle East and Egypt, unparalleled by anything already available to True Seekers. It appeared to be the most complete collection of ancient writings on the planet that formed the very foundation of all the human traditions and beliefs that would emerge thereafter. The NECRONOMICON ANUNNAKI BIBLE is the single most ancient and pure unaltered lore concerning the hottest topics of our time and all times, including divinity, creation, human origins, aliens, religion, pantheistic magickal traditions, alternate dimensions, portals and the afterlife. In this new millennium of uncertainties, it is most likely that the uncovering of the past will reveal our future! I believe in God is the annuaki. I know this so does my farther inlaw.im a very s r rong believer in what you r saying.